I have been getting comments via e-mails, faxes, letters, telegrams, scrolls, etc. - I love hearing from you, and always have! Lately, I have been receiving nothing but positive feedback about this blog, which concerns me. I thank you and will continue to crank these out for as long as the check clears or until I run out of ink-ribbon in my typewriter machine. 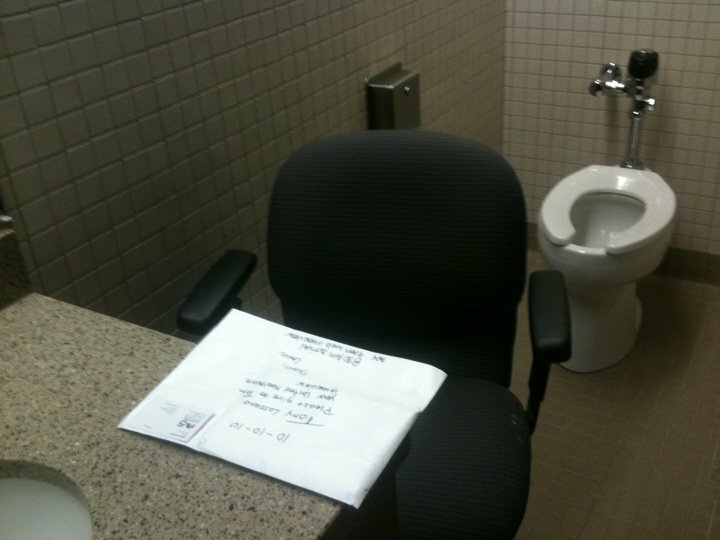 My semi-private "Executive Office" which also comes with a toilet! If you want to share your comments with me, I'll be home between Noon and 4 pm tomorrow, so just stop on by. I am an avid fan of the late night talk shows. 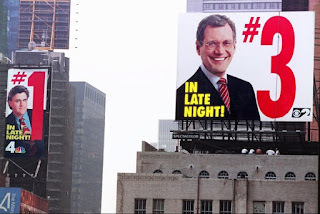 I grew up in the Johnny Carson / David Letterman era, so it is not difficult to figure out how I got hooked in. Late night TV is not grabbing the youth nor seem to be concerned about that for the future. To go younger, NBC has Jimmy Fallen replacing Jay Leno in 6 months, but are the kids even watching him? The answer is yes, if by kids, you mean people in their 50's. And they are getting older each year! Here is a surprising unofficial breakdown of the late night stars, (their own age), and the average age of their audience. I use many different social networks and they are all linked together...sooooo, with one click, a single post can be automatically shared on all of my pages...but where does that end? Could that trigger the others to repost/tweet/share/etc....in an infinite loop that will eventually destabilize space, time and Tumblr. 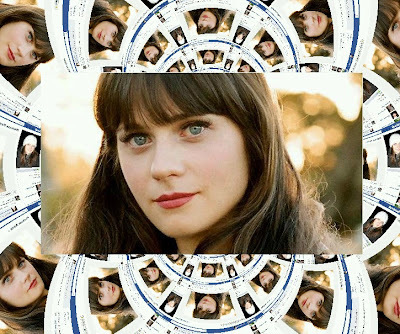 How Many Zooey Deschanel's Are There? I have decided to refocus my affections towards Zooey "The NEW Girl" Deschanel. Yes, the actress...Did you think that I was talking about the Zooey Deschanel that works at the Protein Bar near State & Lake streets? Well, no, not her, and, I think that that girl got transferred to the Merchandise Mart location...and I also believe that her name was not Zooey Deschanel. Anyway, back to the American actress, musician, and singer-songwriter, Zooey Claire Deschanel. She is currently my favorite female. Not just cuz she is funny on her own show, or cuz I like She & Him, (and have liked her singing voice since Elf), or admire her success as a fellow blogger...I have discovered each and every one of these aspects about her, INDIVIDUALLY, before I even knew who she was or her name, or even before that I realized that she is all the same person.